So I have a Phd now. It has been a long road, getting from there to here. Along the way I made close friends, learned things I didn't know I didn't know, and fell in love with my fiancée. To do all this I moved across the world, to live by myself as a stranger in a strange city, to pursue something that none of my ancestors had ever done. For I am, I say with some confidence, the first person in the entire history of my family to ever have a doctorate. (Though I won't be the last!) I am the first black person to get a PhD from my department, and will be the first such person to be employed at the department I am joining. Somewhat relatedly, I am sure I am the first person to include a substantial amount of W.E.B. Du Bois scholarship in a PhD from my department. Reflecting on these things fills me with some pride, I feel that this achievement is a very small part of a greater story about the gradual advance of families and peoples, and I am happy to be a part of that story. Of course, all is not perfect. As I said before at another milestone, I wish more than anything that I could experience this moment with my mother, who I think would most of all have appreciated this. I can only hope that by grace of God we shall one day be reunited and share this joy. A bit more prosaically, there are corrections to be done before I am officially certified. I must admit that the dissertation is not my best work. I am somewhat proud that it followed a structure I had previously advocated for here, but the individual chapters are highly imperfect, and, worse, it is disjointed and lacks a pleasing narrative flow. I struggle with the severe mismatch between my aesthetic ideals and my actual achievements, and it is frustrating that my dissertation should form such a stark example. I know that the next real challenge for me as a thinker is finding a way to more properly link up my various thoughts into some coherent and explicable structure. I had hoped that my dissertation would represent this moment for me, but in all humility I must admit I failed at that endeavour. 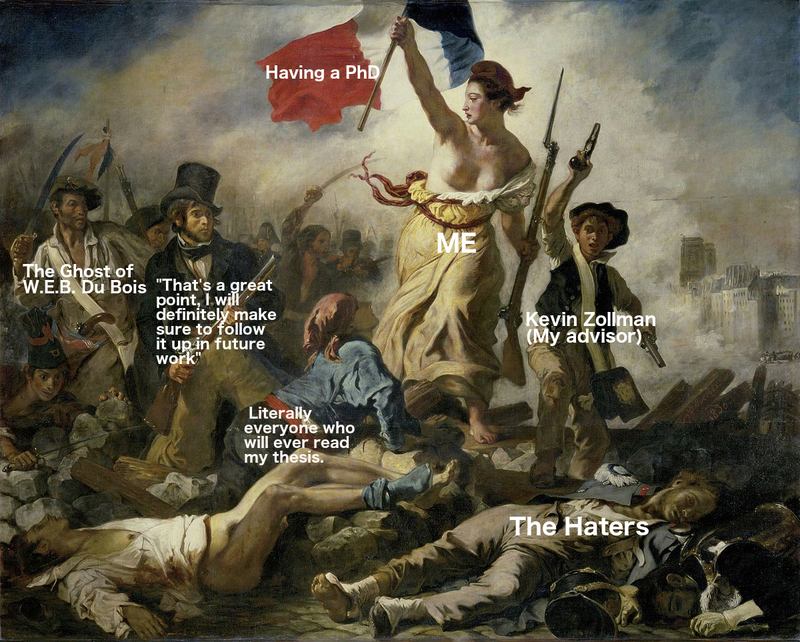 (Don't you know, when I am not literally actually the avatar of Liberty leading the people of France to yet another glorious defeat, I can actually be rather humble.) I note its structural failures by way of encouragement to any current or potential graduate students currently reading this. The dissertation needn't be perfect; whatever it is, it is not a representation of your full worth or potential as a scholar. Generalising a bit, I think that speaks to what kind of a moment this is. Writing up a thesis, being awarded the doctorate, they have something of the structure and feeling of an end, a moment of closure. They cap off an achievement, years of difficult study culminating in a mini-magnum-opus. But, like so many before me, now I am here this conception of things feels totally inadequate. There is so much more I need to learn, so much more I could contribute. When I began studying for the PhD I thought that my goal was to have the community recognise me as a peer expert who has advanced the project of inquiry. But actually getting the PhD feels more like the community acknowledging that I have the capacity to learn and improve, rather than them acknowledging that I have already achieved something which merits reward. That means a lot to me - I spent the first 15 years or so of my education being told I was clever but lazy. That latter half was not without justification, given how I then was. But I worked hard for this, PhDs are not the sort of thing one can generally get just for being clever. It's not just the community acknowledging that I have the capacity to learn and improve, but some concrete proof to myself that I can do as much. I have grown a lot as a person in the time I took getting my PhD. Too many people have helped me in that journey for me to possibly name them here without risk of insulting folk by failure to include them. But if you think this cadre of helpers might include you then it does include you. Thank you, one and all. I will strive to use what strength and the skills you have given me to make the world more kind and wise.